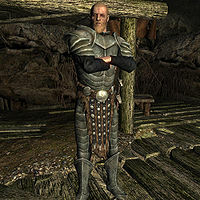 Atar, a Nord warrior, is a mercenary employed by Markarth's Silver-Blood family, stationed in Karthwasten. Due to a recent Forsworn attack on Sanuarach Mine, he and his mercenary band have seized the mine and will not allow the locals of Karthwasten to work; under the instructions of the Silver-Blood family, he is attempting to browbeat Ainethach into selling the silver-rich Sanuarach Mine so the Silver-Bloods can expand their property hold on the Reach. Atar is equipped with a full suit of heavy armor which can be up to steel plate in quality (or Nordic Carved if Dragonborn is installed). He supplements his defensive capabilities with a shield which can be up to ebony in quality. He is equipped with a leveled one-handed weapon which can be as high as Elven at level 22. When you first see him, Atar is conversing with the angry townsfolk led by Ainethach. Ainethach: "I want you sellswords out of my mine." Atar: "Watch your tongue, native. We'll leave when we're sure there's no Forsworn here." Ainethach: "Oh, and when would that be, I wonder? When I sell my land to the Silver-Bloods?" Atar: "The Silver-Bloods have made you a very generous offer for this pile of dirt. I suggest you take it." When spoken to, he may say "The mine is closed. Get lost." or "I've been sent by Silver-Bloods to keep this mine "safe."" If you ask him about the Silver-Bloods, he will supply, "You haven't heard of the Silver-Blood family? They're the most important people in the Reach. They practically own the city of Markarth. And we're here on their coin." If you ask who is in charge of Karthwasten, he will reply with, "I'm not from here. I'm a sellsword. These are my men." When asked about the mine being shut down, he will explain, "Forsworn attacked a while back. Jarl had no men to spare, so the Silver-Bloods generously offered to send us to clean things up. We just want that old native to hand over his land in payment for our services. Then we'll leave, and everyone can get back to work." You may then agree to help him or merely wish him good luck. To the former, he will promise, "Do that and I'll make sure you get a cut." But to the latter, he will merely say, "Right." Once you've dealt with Ainethach, and returned to Atar, he will hand you a leveled amount of gold, saying, "Good work. Here's your cut. I guess this finishes up our contract with the Silver-Bloods, so we'll be heading out." However, if you choose to help the disgruntled townsfolk, and confront him, he will reply hostilely, "Helping out Ainethach, huh? Give me a reason not to plunge a dagger in your chest." You may then choose to Persuade, Bribe, Intimidate, or back down. This whole town wants you out. Leave. (Persuade) Passed: Dealing with a mob wouldn't be good for my coin purse. Fine. We're leaving. You'll listen to gold, I take it? (Bribe) Passed: That I will, stranger. This is more than the Silver-Bloods are paying us. We'll clear out. I think I'll just kill you. (Intimidate) Passed: Whoa. Wait a second. I was just kidding. We'll leave. We'll leave! If you get him to leave, either by helping him or Ainethach, he will only say "Our business is done here." when spoken to. During The Heart of Dibella, you may ask him about Fjotra, but he will brush you off with, "And what's that have to do with me?" This page was last modified on 19 December 2017, at 22:41.